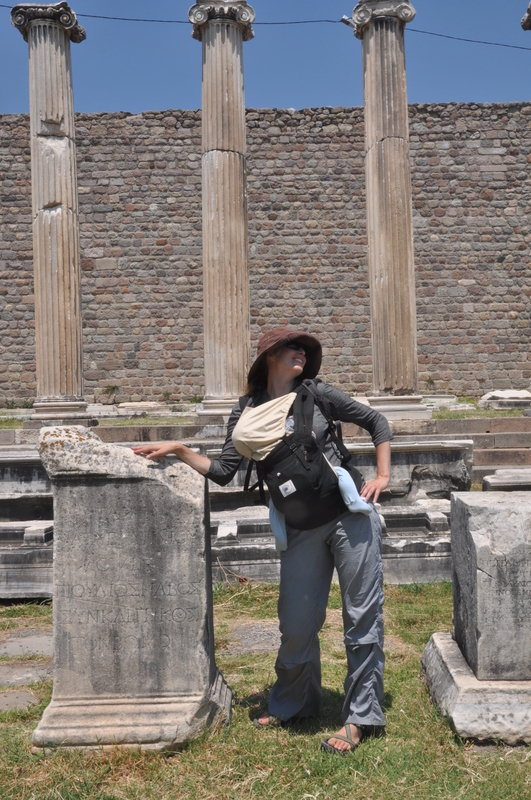 The Ergobaby original carrier in action! A baby carrier that won’t leave you crippled! The strap system on the Ergobaby original baby carrier provides incredible back support, which is not always the case in baby wearing devices. I wore my seven month old son in the Ergobaby for practically three months while traveling through Spain, Morocco, Turkey, and Bulgaria. My son loved being nestled close to my heart, and I was able to wear him for hours. The best thing about the Ergobaby is that it allows you freedom of movement while still cuddling with your child. The Ergobaby comes with a sun cover that snaps over the baby’s head. This cover is wonderful and also allows for privacy while breast-feeding (which surprisingly can be done while the baby is in the carrier!). As the baby grows, the Ergobaby can be worn on the side (something my children never really enjoyed) or transitioned to the back. I have hiked multiple miles using it as a pack. For shorter hikes this is a very comfortable set up for kids up to two years in age. Some people even use their Ergobaby on the back with even older children. The only downside to this carrier is the expense $115-$150. They are very popular and you can find them used in many consignment shops. Even if you pay full price however, this is a lot cheaper than a physical therapy bill from wearing a bad carrier! Note: The review is the author’s opinions, and only based upon her experience.